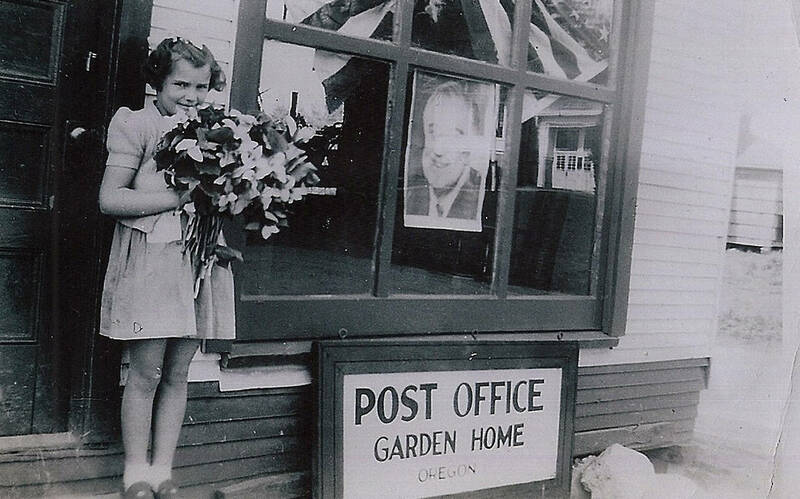 Dorothy Johnson standing in front of the Garden Home, Oregon, Post Office in April 1945, just after the death of President Franklin Roosevelt. She is holding flowers in honor of his death. Roosevelt's portrait and a flag appear in the window. Jean Johnson, Dorothy's mother, took the photograph. Dorothy's father, Gust Johnson, ran the Texaco gas station and garage in Garden Home. Dorothy went on to become Miss Oregon and the first runner-up to Miss America in 1955.